I recently purchased a couple bags of frozen meatballs with a buy one, get one free sale. We’ve been using them for various things like with spaghetti, on their own, with noodles, etc. The kids gobble meatballs right up! I’m usually short on time so I love simple, quick recipes. So, of course, I’m loving this 3 ingredient Ultimate Meatball Recipe. Meatballs, pre-cooked, frozen, 2 lbs. Dump all three ingredients in to a slow cooker. Cook on high for around 4 hours. Done. These types of recipes are great for pitch ins, appetizers, and other social events. Just keep a few of the staple ingredients in your stockpile and you will be ready before you get your invite. 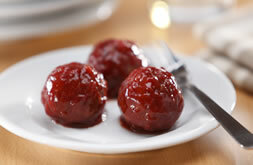 You can find other great recipes and tips on entertaining at the Ultimate Party Meatballs website. How do you cook your meatballs? I wrote this review while participating in a blog tour campaign by Mom Central on behalf of Heinz and Ocean Spray and received the ingredients necessary to facilitate my review. In addition, Mom Central sent me a gift card to thank me for taking the time to participate. This is also great with grape jelly instead of the cranberry sauce.